This post is really relevant right now for me. I am currently finishing of my MA in Design, is there any chance you can point me to where you got this article. I can not find it anywhere online or offline. I have been looking at design thinking for the past 3 years and found it quite strange that Rowe would have been the first to use the term design thinking. Apologies for the late response. My thesis is currently under examination and should be returned very soon. I am hoping that it will be published before the end of the year! I’m also curious what article you’re looking at … currently writing a PhD proposal, and trying to summarize what is known about the (architectural) design process. Archer is getting cited here and there, but he comes across as distinctly outmoded (having phases to the design process and all that), which is why your post made me curious. In what way do you feel Archer is distinctly outmoded? In terms of architecture and design thinking, Donald Schon’s The Reflective Practitioner writes about the design process from an architectural / urban design standpoint. Bryan Lawson is another architect / author that contributed significantly to the development of design thinking. To be clear, I haven’t read much of Archer himself (except a weird, old article in the AA files with lots of cybernetics diagrams), so please correct me if I’m wrong. In my thinking, there’s three basic models of the design process: Analysis Synthesis (Broadbent, Asimov, etc. ), Generate-And-Test (Simon, Mitchell), and Co-Evolution (Dorst, Cross). In Analysis Synthesis, the definition of the problem more or less automatically leads to an (optimal) solution. In Generate-And-Test, we come up with designs (somehow! ), and keep testing them, until we find a satisfactory (not optimal!) one. Importantly, the impetus for a design can be completely separate from its evaluation (aka “the problem”), something that Archer seems to miss completely. Co-Evolution is similar to Generate-And-Test in the sense that the problem does not suggest its solution. It’s even worse in the sense that the problem keeps on changing however. In other words, we generate-and-test designs to throw a new light on the problem, leading us to generate-and-test even more designs. Rather, it sounds like good-old Analysis-Synthesis to me, albeit with a caveat. I understand Archer as saying that first you define the problem, then you do some designing (according to a plan! ), then you find a solution. For me, the key concept of co-evolution is that the design problem can actually change during the design process, and I don’t see this insight reflected here. I also don’t think that Archer has anticipated Rittel – a “wicked” problem is much more than “just” complex – one cannot even properly divide it into sub-problems, as Archer seems to suggest you can: “A single design problem is a complex of a thousand or more sub problems.” The whole idea of design as resolving conflicting sub-problems is spelled out very clearly in Alexander’s “Notes on the Synthesis of Form” (1961), who himself abandoned not much later. I think a contemporary, constructivist, Schoen-like view would be that, of course, you can divided a design problem into sub-problems – it’s just that there’s more than one (in fact, indefinitely many) way to do it, so the partitioning is not something that’s inherent to the problem, but rather something that evolves (that word again!) during the design process. I also don’t agree that Archer has anticipated Simon: Simon is all about “Satisficing” as distinct from “Optimisation” – we have to accept good enough instead of best, because the design space often is indefinitely large, so we have no practical way of finding, or even recognising (!) the optimum. According to Simon, one neither can “generate all the admissible alternatives and compare their respective merits”, nor “recognize the best alternative, even if we are fortunate enough to generate it early” (1996, p. 120). 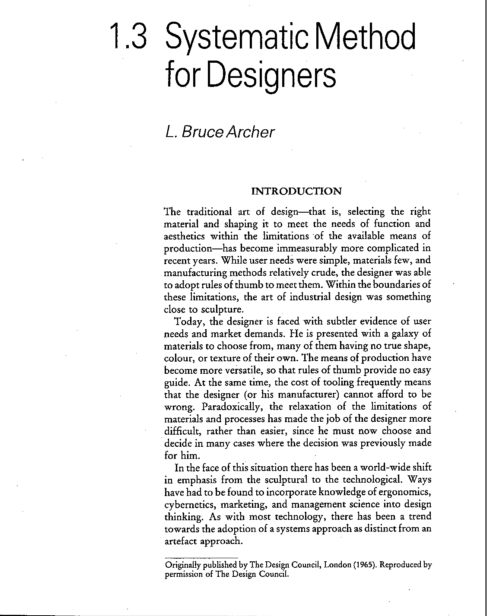 So for me, Archer, is missing all the insights developed after 1965 (unsurprisingly, and we can hardly blame him, of course): Co-evolving, wicked problems without definitive sub-problems, and satisfactory, less than optimal, solutions that are generated quite separately from the design problem. Thanks for this discussion, btw, great to chat with another history of design thinking buff. Let’s me know what you think! Part of the reason Bruce’s work is still a bit obscure is that most of his them are in the RCA library in England and haven’t been published, scanned and put out on the web. BTW – If you compare the core features of DT with nearly anyone else’s method the others typically fall short on at least one major point; the nature and process of Empathic Inquiry. This is VERY interesting and definitely a fantastic contribution to the overall discussion, especially since it’s been laying dormant for so many years. The one disagreement I have with the overall definition has to do with item 2 in that it “must be embodied in/as an artefact” because it insinuates that only the tangible qualifies as design and that design must manifest in a tangible result or it is not design. I have a copy of Systematic Method for Designers and have read a lot of opinions on Archer. He was amazing and brilliant and tried to bridge the gap between artists and engineers, but to really get to the roots of Design Thinking you need to go back further to John Arnold at MIT.